Insulation and sealing play important roles in the building industry. Consequently, high demands are made on materials for sealing building structures. Rubber matting is produced for this task, the most important property of which is a constant thickness to ensure durability, tear resistance and a high sealing capacity. To fulfil these demands a mesh is rolled into the strip and in addition an adhesive foil is applied to bond the strips together. 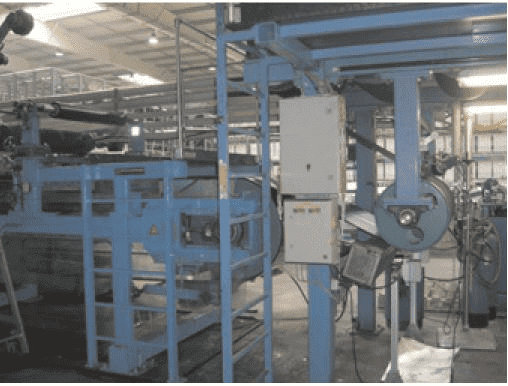 To prevent faulty production, the rubber strip must be measured at the machine directly after extrusion. This facilitates quick intervention in the production process, if any corrections are needed. Previously, measurements were carried out sporadically by means of radiometric measuring units, because this was the only method which proved functional. A disadvantage of this technique however was the high cost of radiation protection to exclude the emission of X-rays. The optoNCDT 1700 is an innovative system with an adjustable measuring rate and exposure time. A lengthy exposure is necessary to compensate for the weak light reflection. 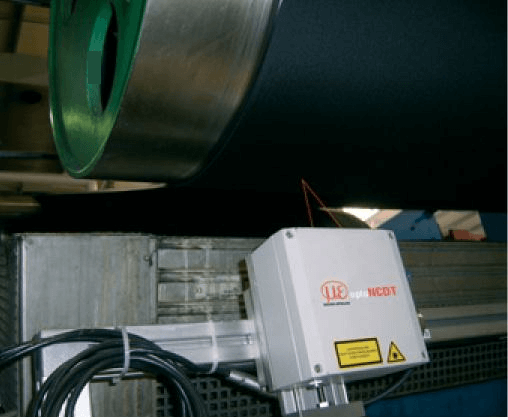 The installation of the sensor in a protective housing keeps it safe from the rubberfumes. The measurement occurs without contact, very accurately and fast. For constant thickness measurement two optoNCDT 1700 sensors are used which, due to the different strip widths, can be adjusted in the traverse direction. The strips must be produced with a thickness of 5 or 7 mm and with a low tolerance. The measurements are passed to the existing control system via an analogue link. The distance of the reference roll is specified fixed in the controller. Therefore, only the distance to the rubber surface is required forthe layerthickness measurement. Due to its controlled exposure time and measuring rate, the optoNCDT 1700 facilitates compensation for the weak reflection. In this case the measuring rate was halved, the exposure time doubled and the measurement filter set to averaging. Due to the extremely high resolution of the optoNCDT 1700, in addition to the distance, also the structures in the mesh of the rubber can be detected. 1. Two optoNCDT 1700-50 sensors on rails, movable in traverse direction. 2. Protective housing SGHF 1800. 3. Data via analogue output to existing controller. 1. Thickness measurement and detection of trends, independent of machine manufacturer. 2. Stable signal despite poor reflectivity. 3. No hazard due to emitted radiation. 4. Savings due to elimination of safety checks for radiometric measurement.